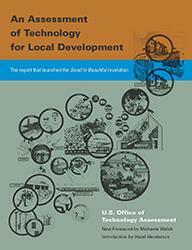 An Assessment of Technology for Local Development, a report originally published in 1981 by the U.S. Office of Technology Assessment (OTA), describes energy-efficient and renewable energy sources being developed and implemented in local communities across the United States. Hazel Henderson, world-renowned futurist who served on OTA's Technology Assessment Advisory Council (TAAC), calls this report "groundbreaking." Michaela Walsh, OTA Project Director for this report, in her new foreword, comments that the work the OTA conducted was "a search for ways to communicate the importance of careful choices for technology, including new and innovative options." This remarkable report is the first in a series of OTA reports republished by the University of Florida Press and Ethical Markets for today's investors, students, entrepreneurs, and policymakers. The new introduction from Ethical Markets founder Hazel Henderson complements the original foreword by Director John C. Gibbons. The U.S. Office of Technology Assessment, founded in 1972 by Congress, examined and anticipated the social and environmental impacts of new technologies, providing Congress with objective, informed analyses of technical innovations affecting society. The OTA, still authorized by Congress, was disbanded in 1996. Ethical Markets Media works to reform markets and metrics and grow the green economy worldwide, providing news and many perspectives with articles, newsletters, and analysis by its founder Hazel Henderson. This joint program with the University of Florida Press to republish these reports is part of Ethical Markets Media's continuing effort to move beyond the unsustainable, fossil-fuel driven Industrial Era toward a cleaner, greener, knowledge-rich Solar Age. www.EthicalMarkets.com.